It’s that time of year: finals are about to be done, Winter break is approaching, and of course, it’s time to get ready for holiday parties galore. This time of year, there is a good chance that you will be invited to an ugly Christmas sweater party. And if you’ve never been to one of these, it’s good to know how to dress for one. The outfits you will see at ugly Christmas sweater parties are a stark contrast to the usual holiday parties where everyone is wearing classy, glamorous looks. However, you will see outfits below that combine Christmas sweaters with all different types of styles, so there’s something for everyone. 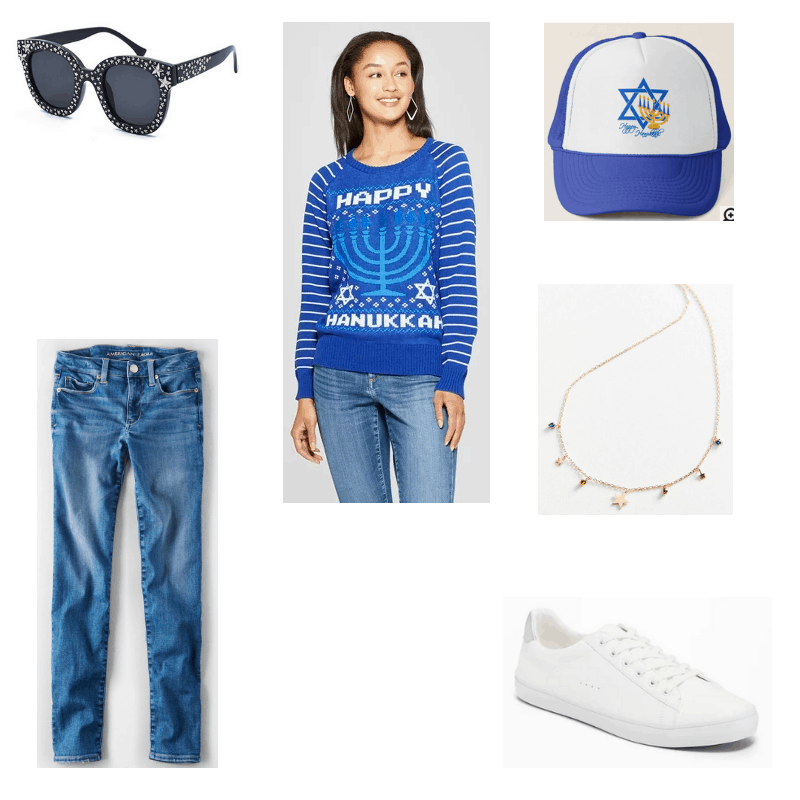 (And just to mix it up a little, there’s a Hanukkah sweater look too.) Let’s get to it. The first outfit includes many items that you likely already have in your wardrobe. These include skinny jeans, pearl earrings, and riding boots (college girl classics). Red is a classic holiday color and snowmen are a symbol of the holidays, so this little snowman tree sweater is perfect. When paired with skinny jeans, riding boots, and pearl earrings, this sweater is the star of the outfit. A knit headband is another thing that you probably have in your wardrobe and it will keep your head warm while giving your outfit a little extra pop. Here’s another classic Xmas sweater look, sized specifically for plus sized women. To get it, wear a fun gingerbread cookie sweater (how cute is this one?) with dark-wash jeans. Studded faux suede ankle boots from Forever 21 have a fun detail, but they still let the green sweater be the focus of the outfit. A blue quartz necklace is simple and adds dimension. Classy holiday parties and ugly Christmas sweaters don’t seem like they’d ever go together. But you can wear an ugly Christmas sweater to a party and still look relatively classy. The sweater above is red and has a sequin reindeer, making it very suitable for a holiday soiree. Pair it with a faux leather skater skirt and semi-opaque tights. Velvet is a commonly seen fabric at holiday parties, especially on dresses and skirts, but why not try velvet heels? It’s a unique way to wear the fancy fabric of the holidays. Gold, red, and black form a classy holiday color palette, so add on some sparkly earrings and match them to a ring, both in gold. A sparkly gold clutch completes this glamorous ensemble. I love the preppy-chic, festive look of a Christmas sweater over a button-down shirt. You probably already have a white button-down in your closet, so rock it underneath this skiing snowman sweater for a cute party look. Add skinny jeans and red Converse sneakers. These sneakers have a festive color and pick up on some of the red in the sweater. 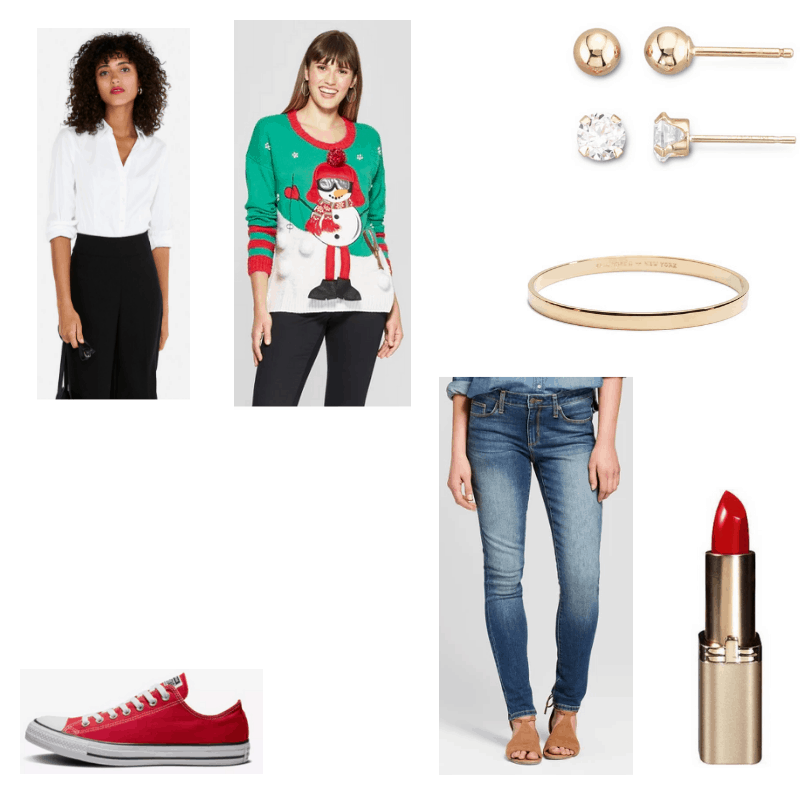 Red lips are a great beauty look for a holiday party — especially an ugly Christmas sweater party — while a gold bangle is simple enough so the Christmas sweater can be the focal point of the look. The gold ball earrings and Zirconia studs both go great with the outfit, so that is why I chose those two sets from JCPenney to include, but you’re free to choose whichever pair you want. You can even mismatch them to create a unique look. 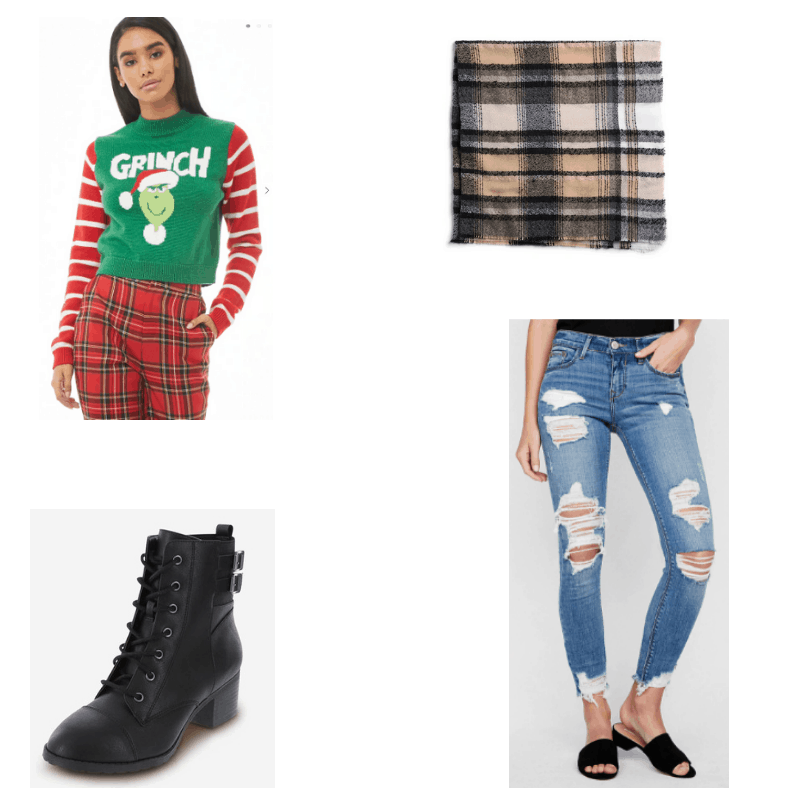 If you have an edgier style, this Christmas sweater outfit is for you. It turns out a Christmas sweater can be edgy and festive at the same time. Start with a grinch sweater for a funny take on sweet holiday sweaters. Toughen up the sweater with ripped jeans and combat boots. Add a plaid blanket scarf for a hint of that grungy plaid all edgy girls love. This outfit is a great way to make a Christmas sweater look boho-chic. Pair a penguin themed sweater with flared jeans. Add heeled ankle boots to lengthen your legs. A knitted headband is comfy and will keep your head warm. Gold is one of the classiest holiday colors and the jewelry reflects that. Gold chain drop earrings, a set of rings, and a layered coin necklace all fit with the bohemian vibe. Here’s an outfit that makes a Christmas sweater look ladylike and sweet, perfect if you have a girly sense of style. 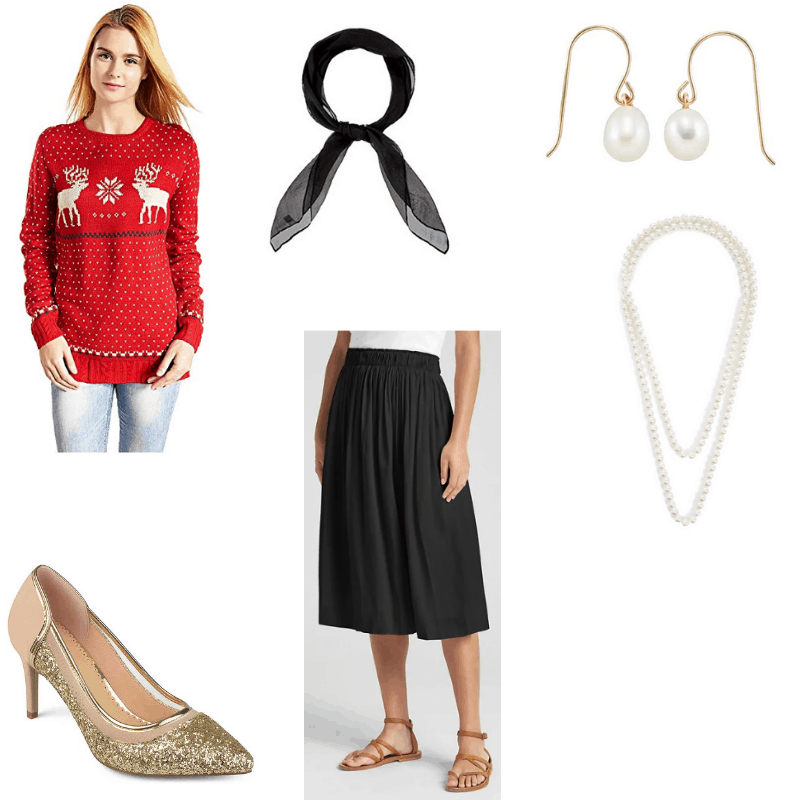 Start off with a red reindeer sweater with a snowflake in the middle and add a black pleated midi skirt. Red, gold, and black is a classy and ladylike color combo that would work for any dressy occasion so add some glittery gold pumps. A chiffon black scarf would make a great headband, especially with a bow at the top. Pearls are ladylike and work for every occasion, so a pearl necklace and pearl earrings add class to this vintage-inspired outfit. Even though this is an article about ugly Christmas sweaters, we know Xmas isn’t the only holiday in town. A Hanukkah sweater is perfect alternative to the Christmas sweater if you celebrate the festival of lights but want to get in on the ugly xmas sweater fun. Stars are symbolic of Hanukkah, so add a star charm necklace. (Note: These are five point stars, not the star of David, just FYI.) The non-star charms will also add flair. While you can wear star-shaped sunglasses, sunglasses with little stars on them are classy and look just as chic. Do any of these outfits appeal to you? Would you wear them? How would you style an Ugly Christmas Sweater? How do you make them suitable for parties? Please tell me your thoughts in the comments.